This week seems to be flying by so quickly. My goodness! Tomorrow is Friday! The next three days are supposed to be warmer than the day before. It was sixty today and sunny as well. This isn't the beginning of our warmer season. It will get cold again, so we enjoy this while it's here. Matthew loves to walk each day and loves the woods more than any other place. He finds all kinds of things. He says that he isn't a hoarder, but a collector. I'm really beginning to wonder though. He has started taking pictures also which I think he is good at. One is below which I think is real nice. but this is small compared to as big as I've seen it. 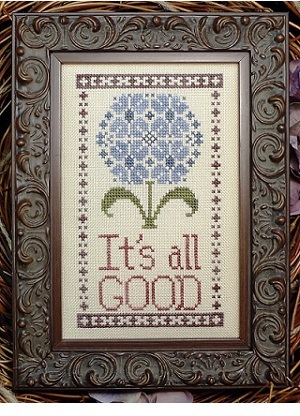 I've been able to get a little cross stitching done every day and have started "It's All Good" just last night. Here is two hours into it. I think this is going to work right up quickly. You can't really tell what it is at this point. people say, "It's all good", and I've said it many times myself. Only five colors total but all hand dyed. Simple but pretty. I've also been working on my wedding gift as well and that's coming along just fine. Wedding is in May and I can hardly wait for the day. It's going to be so special. Will let you, my faithful friends and followers go for now. Keep in mind that I'll be posting soon about my spring giveaway. Will be a fun one to get ready for sure. So until next time, stay safe and warm and remember to "feel the colors". I love your new start...that is going to be so pretty. Thank you Linda. The colors are so soft. It's working right up. Thanks for stopping by. That is a pretty and your are off to a great start. Well thank you Myra. It's a simple stitch and I'm really liking it. Thanks for visiting. I love this chart every time I see it! Happy stitching!